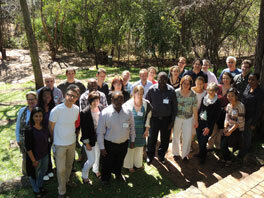 The IeDEA-SA steering group meeting took place from 11 to 13 May 2015 in Victoria Falls, Zimbabwe. Chaired by Matthias Egger and Mary-Ann Davies, site investigators, special guests and the Data Centre Teams from South Africa, Zimbabwe, Malawi, Zambia, Mozambique, Lesotho and Switzerland came together to celebrate the successes of the consortium and to focus on the research agenda and contribution of each cohort/ program for the next 5 years of IeDEA-SA. The meeting was a great success, very productive and enjoyable. And much to everyone’s delight, a tour of the famous Victoria Falls was included in the agenda. Funded by the US National Institutes of Health, the IeDEA consortium addresses unique and evolving research questions in HIV/AIDS that are unanswerable by single cohorts. IeDEA develops and implements methodology to effectively pool the collected data, thus providing a cost effective means of generating large data sets to address high priority research questions. By developing a pro-active mechanism for the collection of key variables, IeDEA enhances the quality, cost effectiveness and speed of HIV/AIDS research.